This Curried Chicken with Couscous contains all of the classic chicken curry flavors – simplified and healthier. 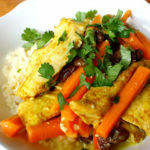 This recipe features a creamy curry base made from coconut milk, tender chicken breasts, and sweet raisins is so deceivingly decadent you’d never guess it’s good for you. If you’ve ever been intimidated by making a curry dish, this chicken curry recipe is a great place to start. It’s extremely simple, and the results are absolutely delicious. This is an excellent recipe to make and freeze in individual portions (freeze couscous in separate containers). We cut the carrots into matchsticks, but you can also slice them into coins. Not a fan of cilantro? Feel free to omit the cilantro garnish or consider using flat-leaf parsley instead. 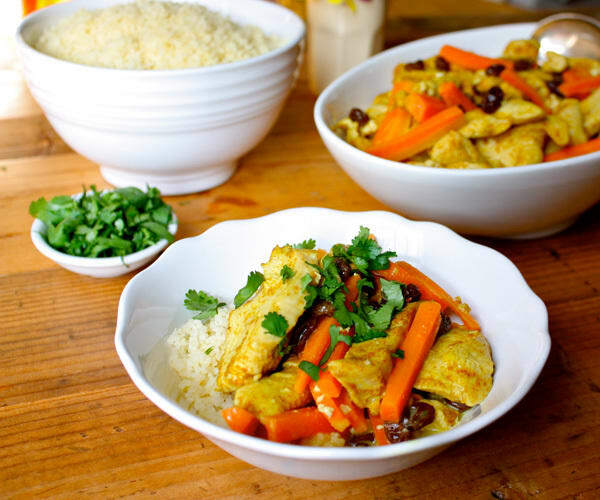 Watch Ultimate Portion Fix creator Autumn Calabrese and her brother, chef Bobby Calabrese make a similar version of this recipe for Curried Chicken with Couscous on their healthy cooking show, FIXATE. This simpler rendition of a classic curried chicken features all the classic curry flavors and is ready in under an hour.